Have you been awaiting increased heating capabilities in the Poweblanket line? Well, if so, your wait is over. The new higher-temperature, Powerblanket 400 line is now available! So what makes Powerblanket 400 different from the standard line of Powerblanket products? Increased heating capabilities, that’s what. The Powerblanket® 400™ industrial heating blankets offer new high-temperature abilities for industries that need higher heat application. Powerblanket 400 heating blankets are able to reach higher temperatures than the standard Powerblanket product line. How high, you ask? If you guessed 400° F, you’d be right. The increased heating capabilities of the Powerblanket 400 heating blanket come as a result of increased wattage and high temperature aluminum heat spreading technology. With 300 watts per square foot of surface area, these blankets deliver a lot of heat. These blankets offer high-powered, high-temperature heating for jobs that need oven-like temperatures. Like so many other Poweblanket models, the new Powerblanket 400 products come in both 120 volt and 240 volt models. Our Powerblanket 400 band heaters are the safe and efficient alternative to traditional silicone band heaters, and our Powerblanket 400 custom options allow for a tailored approach to your specific project. Our proprietary blend of technology has long set us apart from our competition and has enabled us to provide the best, most even heat distribution on the market. Now, with the Powerblanket 400 product in the arsenal, we’ve added to our technological heating approach. The Powerblanket 400 series makes use of high-efficiency aluminum heat-spreading technology, creating increased heat density and a completely even distribution of heat. But it doesn’t stop there either. These new heating blankets also include silicone-coated, 2nd generation fiberglass shells. These fiberglass shells are extremely durable and flame retardant. Where other silicon heat solutions are known to be somewhat unsafe in hazardous conditions, Powerblanket 400 heaters are as safe as all our other products. Since the silicone shells are insulated, there’s no risk of burns or flames if they’re touched by a hand or an unexpected spark. All these features have allowed us to create a solution fit for many heave duty projects, such as resin curing, welding conditioning, manufacturing processes, and much more. Stringent emission controls on diesel have been in place in the US since the Diesel Emissions Reduction Act was put in place in 2005. But did you know they’ve been in place even longer in Europe? Diesel emissions controls have been on the rise in European countries ever since 1992. When it comes to diesel emissions controls, they really don’t get any tougher than those in Europe. Yet, as tough as they already are, they’re only going to get tougher. Plans are already in place to tighten restrictions for on-road vehicles, non-road vehicles, and even marine vessels. For any worldwide and/or European manufacturer, these new rules and regulations are of paramount importance. Or should we say that understanding the new rules is of importance. Technologies in diesel efficiency and emissions controls have increased significantly over the past two decades. In some ways, these technological advancements have come as a necessity in order to answer the demands being placed on diesel-powered vehicles. But in another way, restrictions have increased because of the capabilities made possible by the advancing technologies in diesel engines and fuel additives. It turns out to be one of those chicken-or-the-egg things, and determining which came first could be a difficult matter to pin down. Either way, the reality is simple: restrictions on diesel aren’t going to loosen. So for all those involved in the diesel industry, as well as all those involved in any way with vehicles powered by diesel, have the need to remain apprised of any changes and additions in regulatory measures. That’s why for the past eleven years Integer and AdBlue® have held their annual summit and forum to address matters related to diesel emissions restrictions. This year’s summit will be held in Brussels, Belgium from June 16ththrough 18th. The summit will discuss the industry’s future challenges and the progress it has made and continues to make. AdBlue itself is a Diesel Exhaust Fluid (DEF). DEF is used in Selective Catalytic Reduction (SCR) systems for the after-treatment of exhaust gases. DEF, therefore, is one of the primary components used to maintain compliance with restrictions on diesel emissions. With a SCR systems and DEF, a diesel engine emits much cleaner exhaust. Due to the heavy regulations implemented over the last two decades, DEF has become increasingly important and valuable to those running diesel-powered vehicles. Now, with regulations on the rise again in Europe, one can only imagine how precious a commodity DEF will continue to be, and how much it might be discuss at the upcoming summit. As of last year, the EPA (Environmental Protection Agency) started phasing in the new regulations for diesel engines in the marine industry. Now nearly half way through 2015, diesel exhaust fluid (DEF) is all the more important, even required, for commercial vessels. The EPA started with their plans to implement new emission standards on diesel engines back in 1998. The first target was the commercial trucking industry. Then the new emission standards requiring selective-catalytic-reduction (SCR) systems moved outside of trucking to include off-road vehicles such as backhoes, tractors, dump trucks, combines, large generators, bulldozers, and other similar equipment and vehicles for land use. However, more recently, the same emission standards have moved to include commercial water vessels. When the EPA passed the new standard back in 2004, with plans to phase into it over the next decade, the expectation was to require a reduction in the allowable amount of sulfur in marine diesel fuel by 99%. Such a drop would require not only a new design to diesel engines, but also a SCR that implemented diesel exhaust fluid (DEF) to aid in the reduction of sulfur. Now with these regulations in full force, those in the marine industry have a new, very valuable asset to protect, and that asset is DEF. DEF has storage requirements that need to be adhered to in order to ensure its longevity and efficiency. DEF is used in SCR systems in order to greatly reduce the level of toxins in the emissions of diesel engines. However, like many chemical liquids, DEF needs to be kept within ideal temperature ranges when in storage and transportation, or else its chemical qualities could be compromised. And it probably won’t surprise anyone to learn that the ideal temperature for DEF is well above freezing. However, the problem becomes how to keep large amounts of DEF protected from freezing during the cold months. Heating solutions for DEF have been around for a long time, but finding the proper and most convenient heating solution for this liquid can be tricky. Some tote, barrel, or drum heaters will heat to a high enough temperature, but will do so unevenly, causing cold and hot spots that could ruin your DEF storage. This is why the proper heating solution for DEF protection needs to be able to deliver consistent, even, and regulated heat distribution. Such a capability will ensure that your DEF isn’t overheated in spots and under heated in others. Since DEF should never be heated to more than 86° F, careful temperature regulation becomes extremely important. Along with meeting temperature regulation requirements, you’ll also want a solution that can fit the common DEF storage unit (with customizable options for the less common storage unit) both insulating and heating at the same time. What’s more, when it comes to protecting large quantities of DEF in multiple storage units, you’re going to want a product that you can set and forget. In other words, thermostatic controllers will allow you to set the proper temperature and worry about it no more. The regulations on diesel emissions that were passed by the EPA (Environmental Protection Agency) back in 2010 have, no doubt, affected the commercial trucking industry. While these changes are positive, they did create a need for the use of a new products and procedures. Now this same effect looks to create a similar reaction in the construction and agricultural industries. If you read the last article we published on this topic, then you’ll know all about the new plans for selective catalytic reduction (SCR) systems. As of this year, SCR systems are required in all off-highway vehicles. A vast majority of the diesel vehicles that fall under this distinction belong to three primary industries: mining, construction, and agriculture. This new regulation on diesel emission management has created the need for DEF (diesel exhaust fluid) in vehicles beyond the common commercial truck. Now backhoes, tractors, dump trucks, combines, large generators, bulldozers, and myriad of other equipment and vehicles have to use SCR systems requiring DEF. With the higher demand of DEF and the need to keep large quantities on hand, construction, mining, and agricultural companies have to learn and implement all the best practices associated with DEF. For example, DEF has limitations when it comes to proper storage. DEF is a non-hazardous, liquid material used in SCR systems to minimize toxic emissions from diesel engines. When in storage and transportation, however, this liquid needs to be kept away from possible contaminants and at the proper temperature to ensure it maintains its usual shelf life. The ideal temperature for DEF is above freezing. Since DEF is most often stored outdoors in tanks and vats, this means that companies will need to harbor heating solutions for their DEF storage. Thankfully, third-party vendors have been providing solutions for DEF freeze protection nearly as long as DEF has been around. The proper solution for DEF freeze protection should offer an even and consistent distribution of heat to the entire surface area of the storage unit. This will ensure that your DEF isn’t overheated in one spot while being under heated in another. After all, DEF should never be over 86° F, or its characteristics could be compromised. Additionally, you need a solution that will fit the common DEF storage unit, both insulating and heating at the same time. Thermostatic controls are also important, allowing you to set the proper temperature range without worrying about overheating. And ultimately, you need to work with a vendor that can offer a customized solution, should you ever need to cover and heat an uncommon storage unit. Diesel exhaust fluid (or DEF) has been a mandate for large highway vehicles since 2010—helping to reduce the pollution emitted by trucks and buses by as much as 90%. But did you know that these same regulations are set to extend beyond highway vehicles? In fact, they already have. DEF is an additive used in selective catalytic reduction (SCR) systems. The need for such a product all started in 2001 when the EPA (The U.S. Environmental Protection Agency) announced that all large diesel-run trucks and buses would have to start using SCR in order to reduce the pollutants caused by diesel-exhaust emissions. This mandate was to begin with all 2007 vehicle models moving forward. Ever since this time, SCR systems have been the norm for long-haul trucks and commercial buses. However, the EPA doesn’t plan to stop there. As of 2014, this same regulation now applies to off-highway vehicles too. Off-highway vehicles include anything operating an industrial or large-scale diesel engine. This would include things like construction vehicles (dump trucks, backhoes, bulldozers), and agricultural equipment like tractors, combines, balers, and others. As you can imagine, such regulations will spread the need for good DEF management to industries that haven’t yet needed to consider it. What’s more, the EPA’s plans will require the same of the railroad next year. By 2015, trains and other large rail equipment will need to incorporate SCR systems and will have reason to plan for the proper storage and management of DEF. In the following year, 2016, the marine industry will have to comply with all the same guidelines. Thanks to the EPA’s move to reduce the pollution footprint these vehicles have on the air around us, we can all breathe a little easier. And in addition to this, the EPA’s decision has also made diesel exhaust fluid a precious commodity. From here on, any company responsible for large industrial vehicles will also need to be responsible for large amounts of DEF. Simply storing the quantity of DEF needed to run a diesel fleet can be challenging enough, but the concern doesn’t only involve space. When storing DEF, you also have to make sure it maintains the temperature needed to function properly once it’s in the SCR. DEF density is at its best viscosity between 12-72 degrees Fahrenheit. To keep DEF in its optimum temperature range, you’ll need a solution that can insulate your product, preventing freezing or overheating. Keep in mind that as these regulations move forward, managing your DEF storage effectively becomes imperative to operational consistency. In the end, caring for your DEF will directly affect your bottom line. If you’re transporting large quantities of product, then you know what problems cold weather can pose to your operations. Aside from your products themselves, you have your fleet to worry about too. If you’re running diesel trucks, then cold weather can pose a major obstacle to your DEF storage, and ensuring proper DEF protection becomes imperative. When it comes to storing DEF, you have to make sure it doesn’t freeze. This goes without saying, of course. But ask yourself this question: is my current solution for DEF storage adequate, inexpensive, and easy to use? If not, then there’s room for improvement, right? And if your DEF storage procedures are not taking freeze control into account, then you could be putting a very valuable asset at risk. DEF does have a pretty low freezing point, 12° F to be precise. And while this excludes a lot of regions in the US (and around the world for that matter) as being danger zones for dysfunctional DEF, there are still plenty of regions that need to concern themselves with adequate DEF protection, such as the whole country of Canada, for example. Since the 2010 mandated regulations on diesel exhaust, the demand for DEF in the United States has only increased. If you’re in the DEF supply business, the important question now is how to keep your valuable product safe from the effects of cold weather. According to DiscoverDEF.com, “the shelf life of DEF is two years, if the fluid temperature remains between 15ºF and 65ºF (-9ºC and 18ºC). Where DEF is stored outside in bulk tanks or totes, then heating and cooling solutions are available to ensure it is kept within the correct temperature range, (http://www.discoverdef.com/def-equipment/handling-guide/).”So for all of you who have to store your DEF outdoors, the big question is what to do during cold weather, so as not to compromise the life of your DEF. Well, that’s where Powerblanket comes in. When it comes to freeze protection and heating technology, not all solutions are created equal when it comes to industrial heaters. In fact, some heating solutions are extremely outdated with technology dating back several decades. Today’s consumers are demanding products to be higher quality and they want them delivered faster than ever before. With this increase in standards, businesses can’t afford to be stuck with old heating technology. Businesses that use older heating technology deal with uneven heating, dangerous heating elements, and the inability to customize for specific tasks. One of the biggest complaints about older heating technology is uneven heating. Older technology uses a centralized heating unit that emits a lot of heat in one or two locations. The hope is that the heat will spread and keep the entire unit from freezing. This process doesn’t work if you have sensitive materials or a large area to heat. The centralized heat source gets really hot in one location, often burning product and materials. So if your business has sensitive materials and products, older heating solutions are not an option. Electrical heating blankets with GreenHeat Technology™ are a newer heating solution that evenly distributes heat across the entire surface area. Blanket heaters eliminate hot and cold spots and safely regulate the temperature to keep materials and products from burning. Whether you’re looking for a drum heater, bucket heater, tote heater, pipe heater, tank heater, or valve heater; it’s important that the heat is spread out evenly. Businesses are scrambling, trying to keep up with a demanding marketplace. This means businesses need to find quick and adaptable solutions to their problems. Old heating technology like band heaters and space heaters are not able to meet the needs of modern industrial businesses. The dated technology of band heaters and space heaters limits their use to a few applications. If your business has odd shaped tanks or large surface areas to heat, older style heaters are not the answer. The flexibility of electric blanket heaters allows them to be customized for almost any heating application. Custom heating solutions are needed more and more because standard heating products are unable to meet the needs of today’s industrial businesses. If you need to closely regulate the temperature of your products and materials or need to heat a large or uneven tank, electric heating blankets can be customized to solve your heating problem.. Older style heaters can be dangerous. Band heaters have an extremely hot surface area that will burn you if touched. The problem with this technology is once it’s turned on, it’s almost impossible to remove it without getting burned. Heating blankets are a new heating technology that can be easily added or removed at anytime of the heating process. Electrical heating blankets use reliable, internal thermostats so once they’re turned on, you don’t have to worry about them over heating. Just plug them in and forget about them. When it comes to a safe heating technology, electrical heating blankets are a great heating solution. Colder weather causes all sorts of problems while working in outside, ambient conditions. It can be particularly troublesome when working with temperature sensitive materials. Operations are transitioning from smaller storage containers, to pallet containers and large, bulk storage tanks. Finding the right heating solution for bulk material presents a challenge. One option is to store product and containers in a warehouse or shed and heat the entire building. While this is an option, it is not effective or energy efficient. Heating a separate building to store product can cost hundreds of dollars per day in energy alone. It’s also really difficult to bring product and material up to temperature in a timely manner by simply blowing in warm air. Portability – Look for a solution that will allow you to transport the material to different locations heated and protected. A portable solution will also allow you to heat your material while at a job site. Energy Efficient – Find a solution that will maximize efficiency and retain most of the heat being generated. Heating solutions such as blanket-type heaters are extremely effective and energy efficient because they have direct contact to the thermal load. Effective – Bringing material up to temperature in a timely manner is critical to most operations. Time is money. Having a direct heat source with great heat retentive properties will achieve this. A blanket-type heater, which is also insulated, will achieve this. Temperature Control – Sometimes having temperature control capability is critical to a successful operation. Overheating or under heating can ruin product, render it unusable and cause downtime. Find a heating solution that allows you to control the temperature based on your job-site requirement and product blend. Custom Design Capability – Partner with a heating company that has in-house engineering and is willing to custom design a heating solution for your unique needs. Take the time to do some research and collaborate with heating experts to determine what heating solution will best achieve your desired end result. Diesel Exhaust Fluid (DEF) is used to meet the strict US EPA emissions regulations for diesel engines. DEF is a fluid that is injected into a Selective Catalytic Reduction (SCR) system. The SCR technology uses an urea based DEF and a catalytic converter to significantly reduce the emissions of nitrogen oxides (NOx). The higher oxygen levels provided by DEF results in a more efficient combustion. This equates to clean nitrogen and water emissions and maximized fuel efficiency. It’s important to note that the United States Environmental Protection Agency (US EPA) will limit NOx levels and will require North American trucks to be equipped with SCR after 2010. DEF is stored in a tank onboard the vehicle, and injected into the exhaust stream by a metering system at a rate of 2% of diesel consumption volume. Newer trucks have storage systems available that will hold up to 20 gallons. Selective Catalytic Reduction and Diesel Exhaust Fluid systems are really not that intimidating once you do some research and learn what you need to know about them. In warmer regions it is recommended to store DEF in a shaded area. What are Storage Options for Diesel Exhaust Fluid (DEF)? Diesel Exhaust Fluid or DEF is a high purity chemical solution containing 32.5% urea mixed with high purity deionized water. It’s used to stay in compliance with the Environmental Protection Agency (EPA) stringent emissions requirements mandated in 2010. DEF is used in conjunction with a technology called Selective Catalytic Reduction (SRC) as an injection to reduce harmful NOx. With such a large and growing need for DEF product there is also obviously the need to store it properly. Several types of storage container options are available that range from 2.5 gallon buckets to 8500 gallon tanks, and everything in between. Purchasing DEF in the smaller containers is more expensive per gallon and typically used for emergency supply for trucks. The larger containers, or bulk storage tanks, are primarily used with very large fleets. While the great bulk tanks are more cost effective per gallon (buying in bulk is always a bargain. Just ask the millions of Costco lovers around the world) they can be an expensive initial investment. This is why most DEF storage containers tend to be “mini-bulk” storage containers. 330 gallon totes and 55 gallon drums seem to be the trend with many companies right now. Both can be refilled easily and there are several equipment companies that offer electrical or pneumatic pump and hose systems that work well with these containers. There are also freeze protection solutions available for storage in extreme cold climates. The important thing to remember is to keep your DEF contaminant free. DEF is not harmful to touch and if you get it on your skin you can wipe if off easily without worrying about chemical burns, but contaminated DEF can cause harmful side effects to your SRC system, which can be devastatingly costly to repair or replace. Proper storage and handling care is essential to prolonging the life of this important material. How Long Will it Take My Powerblanket Product to Heat My Materials? It’s a great question and one I get asked over and over. You would think that such a consistently asked question would merit a quick answer for it. Unfortunately, we have to ask our own questions first to give a good answer. I realize how odd this sounds but let me ask you this … do you know how temperamental the heat transfer process can be? Allow Wikipedia to explain: “Heat transfer is a discipline of thermal engineering that concerns the generation, use, conversion and exchange of thermal energy and heat between Physical systems.” What this means to those of us who suffer with a non-engineer-type brain (yes, I do work with a few engineers and I have every right to pick on them once in a while!) is that there are many variable that contribute to how heat is transferred from one object to another. This alters the time frame of heating something to the right temperature. When heat transferrers using our products, it is typically happens through conduction. Not always, but most of the time. “Conduction is the transfer of heat between substances that are in direct contact with each other. The better the conductor, the more rapidly heat will transfer.” This means the snugger you apply your Powerblanket wrap – without adding additional straps – the better the heat will transfer. Another variable that will play havoc on heat transfer is wind. Heat hates wind. In almost all cases wind will swoop in and steal heat from just about anything. That is not to say a Powerblanket wrap won’t heat, but only that it could take longer to get it there. Ambient temperatures also play a determining factor in heat-transfer time. If the desired temperature is 70°F and your ambient is -20°F it will take quite a bit longer to get there than if your ambient was 65°F. Make sense? Of course it does. So, now you see that this one simple question, “how long will it take to get hot?” cannot be answered quickly and there is not a one-size-fits-all answer. How Do I Keep My DEF Tote From Freezing? Freezing is one of DEF’s (Diesel Exhaust Fluid) bigger problems. DEF is made up of a 32.5% urea solution and 67.5% de-ionized water and it may freeze at temperatures at or below 12°F. However, keeping the frost at bay is as easy as 1, 2, industrial electric blanket. Storing and dispensing DEF in cold areas presents many challenges. 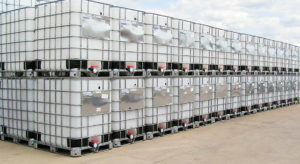 DEF storage containers range from two-and-a-half gallon jugs to bulk systems that hold anywhere from 300 to 4000 U.S. gallons. Because these will freeze in cold weather, they need protection. Additionally, if you’re using dispensers like a DEF pump or an electric tote pump, your product can freeze in the pump and hose. This prevents dispensing –even if the fluid in the container hasn’t frozen yet. Building an outbuilding to store DEF product can cost tens of thousands of dollars and use unnecessary resources. Many facilities also have to pay a premium on space, making indoor storage not feasible for many. Protects the pump and hose. Fully wraps around the entire tote and dispensing unit. Keeps the DEF at its optimal temperature while factoring in heat loss from wind and cold temperatures. Evenly heats so the DEF is not overheated in patches or left unprotected. Utilizes a thermostatic controller to monitor and maintain the proper temperature. Whether you’re storing DEF, powdered milk, or toxic chemicals in your IBC tote, rest assured that Powerblanket has you covered…quite literally. For more information about Heavy-Duty Highway Diesel Program visit the U.S. Environmental Protection Agency.